"LIRR" redirects here. For other uses, see Lirr (disambiguation). The Long Island Rail Road (reporting mark LI), often abbreviated as the LIRR, is a commuter rail system in the southeastern part of the U.S. state of New York, stretching from Manhattan to the eastern tip of Suffolk County on Long Island. With an average weekday ridership of 354,800 passengers in 2016, it is the busiest commuter railroad in North America. It is also one of the world's few commuter systems that runs 24 hours a day, 7 days a week, year-round. It is publicly owned by the Metropolitan Transportation Authority, which refers to it as MTA Long Island Rail Road. The Long Island Rail Road provides electric and diesel rail service east-west throughout Long Island, New York. Gray lines represent freight-only branches, and other colors represent the corresponding passenger branches. The LIRR logo combines the circular MTA logo with the text Long Island Rail Road, and appears on the sides of trains. The LIRR is one of two commuter rail systems owned by the MTA, the other being the Metro-North Railroad in the northern suburbs of the New York area. Established in 1834 and having operated continuously since then, it is one of the oldest railroads in the United States still operating under its original name and charter. There are 124 stations and more than 700 miles (1,100 km) of track on its two lines to the two forks of the island and eight major branches, with the passenger railroad system totaling 319 miles (513 km) of route. As of 2018[update], the LIRR's budgetary burden for expenditures was $1.6 billion, which it supports through the collection of taxes and fees. 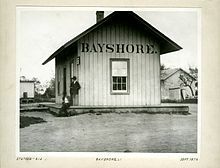 The Long Island Rail Road Company was chartered in 1834 to provide a daily service between New York and Boston via a ferry connection between its Greenport, New York, terminal on Long Island's North Fork and Stonington, Connecticut. This service was superseded in 1849 by the land route through Connecticut that became part of the New York, New Haven and Hartford Railroad. The LIRR refocused its attentions towards serving Long Island, in competition with other railroads on the island. In the 1870s, railroad president Conrad Poppenhusen and his successor Austin Corbin acquired all the railroads and consolidated them into the LIRR. The LIRR was unprofitable for much of its history. In 1900, the Pennsylvania Railroad (PRR) bought a controlling interest as part of its plan for direct access to Manhattan which began on September 8, 1910. The wealthy PRR subsidized the LIRR during the first half of the new century, allowing expansion and modernization. Electric operation began in 1905. After the Second World War, the railroad industry's downturn and dwindling profits caused the PRR to stop subsidizing the LIRR, and the LIRR went into receivership in 1949. The State of New York, realizing how important the railroad was to Long Island's future, began to subsidize the railroad in the 1950s and 1960s. In June 1965, the state finalized an agreement to buy the LIRR from the PRR for $65 million. The LIRR was placed under the control of a new Metropolitan Commuter Transit Authority. The MCTA was rebranded the Metropolitan Transportation Authority in 1968 when it incorporated several other New York City-area transit agencies. With MTA subsidies the LIRR modernized further, continuing to be the busiest commuter railroad in the United States. The LIRR is one of the few railroads that has survived as an intact company from its original charter to the present. The LIRR ticket counter at Penn Station displays all locations accessible from Penn Station. Pennsylvania Station, in Midtown Manhattan, is the busiest of the western terminals, serving almost 500 daily trains. It is reached via the Amtrak-owned East River Tunnels (the only LIRR-used trackage not owned by the LIRR) from the Main Line in Long Island City. The New York City Subway's 34th Street–Penn Station (IRT Broadway–Seventh Avenue Line) (1, ​2, and ​3 trains) and 34th Street–Penn Station (IND Eighth Avenue Line) (A, ​C, and ​E trains) stations are next to the terminal. It also connects LIRR with Amtrak and NJ Transit trains. Atlantic Terminal, formerly Flatbush Avenue, in Downtown Brooklyn serves most other trains. It is next to the New York City Subway's Atlantic Avenue–Barclays Center station complex (2, ​3, ​4, ​5​, B, ​D, ​N, ​Q​, R and ​W​ trains), providing easy access to Lower Manhattan. Rush-hour trains run to one of two stations in Long Island City, Queens: the Hunterspoint Avenue station, or the Long Island City station on the East River. From Hunterspoint Avenue, the Hunters Point Avenue subway station (7 and <7>​ trains) can be reached for Midtown Manhattan access. The same subway trains can also be reached from Long Island City station at the Vernon Boulevard–Jackson Avenue subway station. It also connects to the NYC Ferry's East River Ferry to Midtown or Lower Manhattan. Access to a fourth major terminal is under construction. As early as 2022, the LIRR intends to start service to a new station under Grand Central Terminal via the East Side Access; provision was made for this route on the lower level of the 63rd Street Tunnel under the East River, which carries the New York City Subway's IND 63rd Street Line (F train) on its upper level. The East Side Access project will reduce congestion while increasing the number of trains during peak hours. However, some February 2014 estimates push the opening date as far back as September 2024. In addition, the Jamaica station is a major hub station and transfer point in Jamaica, Queens. It has eight tracks and five platforms, plus yard and bypass tracks. Passengers can transfer between trains on all LIRR lines except the Port Washington Branch. A sixth platform with two tracks is under construction and will serve Atlantic Branch shuttle trains to Brooklyn once completed. Transfer is also made to separate facilities for three subway services at the Sutphin Boulevard–Archer Avenue–JFK station (E​, ​J, and ​Z trains), a number of bus routes, and the AirTrain automated electric rail system to JFK Airport. The railroad's headquarters are next to the station. Schematic of LIRR's routes, as well as the fare zones. This schematic is not to scale. Main Line, running along the middle of the island, between Long Island City and Greenport, via Jamaica. Montauk Branch, running along the southern edge of the island, between Long Island City and Montauk, via Jamaica. Atlantic Branch, running mostly in New York City to the south of both the Main Line and Montauk Branch, between Atlantic Terminal and Valley Stream, via Jamaica. They spin off eight minor branches. For scheduling and advertising purposes some of these branches are divided into sections such as the case with the Montauk Branch, which is known as the Babylon Branch service in the electrified portion of the line between Jamaica and Babylon, while the diesel service beyond Babylon to Montauk is referred to as the Montauk Branch service. All branches except the Port Washington Branch pass through Jamaica; the trackage west of Jamaica (except the Port Washington Branch) is known as the City Terminal Zone. The City Terminal Zone includes portions of the Main Line, Atlantic, and Montauk Branches, as well as the Amtrak-owned East River Tunnels (Northeast Corridor) to Penn Station. The Main Line runs from Long Island City east to Greenport. It is electrified west of Ronkonkoma; limited diesel train service runs from this point to Yaphank, Riverhead, or Greenport. Trains using the East River Tunnels (Northeast Corridor) from New York Penn Station join the line at Sunnyside Yard. The services that run along this line are named after the branches they use; trains beyond Hicksville (where the Port Jefferson Branch splits), are known as Ronkonkoma Branch and Greenport Branch trains. The Montauk Branch runs from Long Island City east to Montauk, with junctions with the Main Line at Long Island City and Jamaica. It is electrified from Jamaica east to Babylon. Trains operating east of Babylon are listed as Montauk Branch service and are hauled by diesel locomotives; trains using the line from Jamaica to Babylon are labeled Babylon Branch trains. 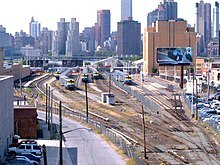 The portion of the line between Long Island City and Jamaica no longer carries passenger trains and is used only for freight service. The electrified Atlantic Branch runs from Atlantic Terminal in Downtown Brooklyn east to Jamaica, where it meets the Main Line and the Montauk Branch, and then heads southeast to become the Long Beach Branch east of Valley Stream. East of Valley Stream, the Far Rockaway Branch turns south, while the West Hempstead Branch turns northward. The electrified Port Washington Branch, the only one that does not serve Jamaica, branches from the Main Line west of Woodside (does not curve away from Main Line until Winfield Junction, which is east of that station) and runs east to Port Washington. It only serves four stations in Nassau County. The electrified Hempstead Branch splits from the Main Line east of Queens Village (does not curve away from Main Line until just after Floral Park) and runs east to Hempstead. At Garden City, the Garden City-Mitchel Field Secondary curves off and goes to Mitchel Field. The electrified West Hempstead Branch splits from the Montauk Branch east of Valley Stream and runs northeast to West Hempstead, originally continuing to junction the Hempstead Branch and the Oyster Bay Branch at the Main Line. As of November 22, 2014, weekend service on the branch has been restored. The Oyster Bay Branch splits from the Main Line east of Mineola and heads north and east to Oyster Bay. The first section to East Williston is electrified; only diesel trains run along the majority of the line to Oyster Bay. The diesel-only Central Branch runs southeast from the Main Line east of Bethpage to the Montauk Branch west of Babylon, giving an alternate route to the Montauk Branch east of Babylon. The Central Branch used to continue west from Bethpage to include what is now the Garden City–Mitchel Field Secondary. It will be electrified as part of the 2020-2024 MTA Capital Program. The electrified Far Rockaway Branch splits from the Atlantic Branch east of Valley Stream and runs south and southwest to Far Rockaway. It used to continue west along what is now the New York City Subway's IND Rockaway Line to Hammels and Rockaway Park. The electrified Long Beach Branch begins where the Atlantic Branch ends east of Valley Stream (does not curve away from Montauk Branch until just after Lynbrook) where it turns south to end at Long Beach. The railroad has dropped a number of branches due to lack of ridership over the years. Part of the Rockaway Beach Branch became part of the IND Rockaway Line of the New York City Subway, while others were downgraded to freight branches, and the rest abandoned entirely. Additionally, the Long Island Railroad operated trains over portions of the Brooklyn Rapid Transit (BRT) elevated and subway lines until 1917. The Bethpage Branch ran north from the Main Line and Central Branch at Bethpage. 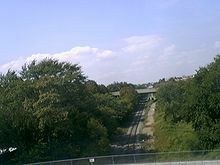 The Bushwick Branch, also called the Bushwick Lead Track, is a freight railroad branch that runs from Bushwick, Brooklyn, to Fresh Pond Junction in Queens, where it connects with the Montauk Branch. The Camp Upton Branch was a short branch north from the Main Line to Camp Upton. The Cedarhurst Cut-off, officially known as the New York and Rockaway Railroad, was an extension of the Montauk Branch from its merger with the Atlantic Branch at Springfield Junction to the Cedarhurst, where it would turn west and run parallel to the Far Rockaway Branch until reaching Mott Avenue in Far Rockaway. The Central Extension ran from Garden City eastward to Central Park (¾ mile south of current Bethpage station) and as far east as Bethpage Junction. The line was cut back to the point where it stopped at Island Trees. Today the western part of track still in use for freight and storage, and is officially known today as the Garden City Secondary. The Chestnut Street Incline (Brooklyn) between Atlantic Avenue and Fulton Street was opened in 1898 to allow for thru-operation over the Jamaica/Broadway Elevated Line to the East River ferry terminal. In 1909 thru passenger service to Manhattan via the Williamsburg Bridge was established in coordination with the Brooklyn Rapid Transit Company (BRT). LIRR Passenger service operated to Chambers Street between May 1909 and September 1917. The Creedmoor Branch, a remnant of the Central Railroad of Long Island (CRRLI) of Alexander Turney Stewart, was a short branch from the Main Line at Floral Park northwest through Creedmoor. It once went as far northwest as Flushing. The Evergreen Branch connected the Bushwick Branch east of Bushwick Terminal with the Bay Ridge Branch north of East New York. The Flushing Bay Freight Spur extended north from the Whitestone Branch, then across the Woodside Branch and then the connecting line between both branches before terminating along the south coast of Flushing Bay. The Flushing Branch, also known as the Flushing Village Railroad was a short spur southeast from the Port Washington Branch in Flushing. It began at Great Neck Junction along with the CRRLI, then broke away at College Point Boulevard, and terminated between Murray Hill and Broadway stations. The Glendale Cut-off ran south from the Main Line at Rego Park to the Montauk Branch at Glendale. There it became the Rockaway Beach Branch, running south across Jamaica Bay to Hammels and west to Rockaway Park. The Rockaway Beach Branch south of Ozone Park is now the IND Rockaway Line of the New York City Subway. The Lower Montauk Branch ran from Long Island City to Jamaica, passing neighborhoods including Maspeth, Middle Village, and Richmond Hill. The Manhattan Beach Branch ran south from the Bay Ridge Branch at Flatbush to Manhattan Beach. The Manorville Branch or Manor Branch ran from the Main Line at Manorville southeast to the Montauk Branch at Eastport. It was originally part of the Sag Harbor Branch (See below). The Mineola-West Hempstead Branch ran north of the terminus of the West Hempstead Branch across NY 24 to Country Life Press Station where it briefly joined the Hempstead Branch then ran north of the Garden City Secondary towards a wye at Mineola Station with one branch that terminated at the station and another that crossed the main line and ended near the southern terminus of the Oyster Bay Branch. The Northport Branch ran northeast of the current Port Jefferson Branch between Greenlawn and Northport Village. The North Shore Freight Branch ran from the Main Line at Sunnyside Yard west to the East River where Gantry Plaza State Park is now. Originally built by the Flushing and North Side Railroad, some of the surviving right-of-way can be found at the Arch Street Shops within the Sunnyside Yard. The Roosevelt Field Spur branched off northward from the current Garden City Secondary just north of Commercial Avenue. From there, it crossed Stewart Avenue just west of present-day South Street before turning slightly northeast, crossing over the Meadowbrook Parkway. The overpass, as well as sections along the sidewalk on South Street, can still be seen today. From there, it continued north before curving east and coming to an end near Zeckendorf Boulevard. The line was used for freight only. The Sag Harbor Branch ran north from the Montauk Branch at Bridgehampton to Sag Harbor. The Wading River Branch ran east from Port Jefferson to Wading River, serving the towns of Mount Sinai, Miller Place, Rocky Point, and Shoreham. The White Line, which was built by the LIRR subsidiary Newtown and Flushing Railroad ran south of the Port Washington Branch between Winfield Junction and Flushing between 1873 and 1876. The Whitestone Branch, which was originally built by the Flushing and North Side Railroad (F&NS), split from the Port Washington Branch near Flushing and ran north and east to Whitestone. The Woodside Branch ran north of the current Port Washington Branch between Woodside and east of the present Corona Yard west of the Flushing River. It also had a connecting spur to the Whitestone Branch. From April to October, the railroad adds stops at Mets–Willets Point station to trains on the Port Washington Branch to serve passengers traveling to see New York Mets home games at Citi Field and the US Open at the USTA Billie Jean King National Tennis Center. When the number of passengers requires it, additional trains may be added. The railroad operates extra trains during the summer season that cater to the Long Island beach trade. Special package ticket deals are offered to places like Long Beach, Jones Beach, the Hamptons, Montauk, and Greenport. Some of these packages require bus and ferry connections. The railroad operates extra trains to and from Atlantic Terminal for Brooklyn Nets/New York Islanders home games at Barclays Center. From May through October, the railroad runs four daily trains to Belmont Park (two in each direction) during the racetrack's summer meets. Additionally, on the day of the Belmont Stakes horse race the railroad runs extra trains to accommodate the large number of spectators attending the event. One special non-passenger service offered by the railroad was the yearly operation of the Ringling Brothers Barnum and Bailey Circus train between Long Island City and Nassau Veterans Memorial Coliseum in Garden City. Highly publicized by the LIRR, this event drew large crowds of spectators. With Ringling Bros. Barnum and Bailey's closure, this was discontinued in May 2017. 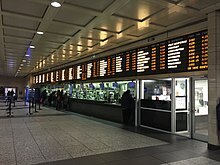 Penn Station offers connections with Amtrak intercity trains and NJ Transit commuter trains, as well as the PATH, New York City Subway, and New York City Bus systems. Additionally, almost all stations in Brooklyn and Queens offer connections with the New York City Bus system, and several stations also have transfers to New York City Subway stations. Transfers to Nassau Inter-County Express and Suffolk County Transit buses are available at many stations in Nassau and Suffolk counties, respectively. Like Metro-North Railroad and NJ Transit, the Long Island Rail Road fare system is based on the distance a passenger travels, as opposed to the New York City Subway and the area's bus systems, which charge a flat rate. The railroad is broken up into eight non-consecutively numbered fare zones. Zone 1, the City Terminal Zone, includes Penn Station, all stations in Brooklyn, and all stations in Queens west of Jamaica or Mets–Willets Point. Zone 3 includes Jamaica and Mets–Willets Point, as well as all other stations in eastern Queens except Far Rockaway. Zones 4 and 7 include all stations in Nassau County, plus Far Rockaway in Queens. Zones 9, 10, 12 and 14 include all stations in Suffolk County. Each zone contains many stations, and the same fare applies for travel between any station in the origin zone and any station in the destination zone. Peak fares are charged during the week on trains that arrive at western terminals between 6 AM and 10 AM, and for trains that depart from western terminals between 4 PM and 8 PM. Any passenger holding an off-peak ticket on a peak train is required to pay a step up fee. Passengers can buy tickets from ticket agents or ticket vending machines (TVMs) or on the train from conductors, but will incur an on-board penalty fee for doing so. This fee is waived for customers boarding at a station without a ticket office or ticket machine, senior citizens, people with disabilities or Medicare customers. There are several types of tickets: one way, round trip, peak, off-peak, AM peak or off-peak senior/citizen disabled, peak child, and off-peak child. On off-peak trains, passengers can buy a family ticket for children who are accompanied by an 18-year-old for $0.75 if bought from the station agent or TVM, $1.00 on the train. Senior citizen/disabled passengers traveling during the morning peak hours are required to pay the AM peak senior citizen/disabled rate. This rate is not charged during PM peak hours. Commuters can also buy a peak or off-peak ten trip ride, a weekly unlimited or an unlimited monthly pass. Monthly passes are good on any train regardless of the time of day, within the fare zones specified on the pass. During the summer the railroad offers special summer package ticket deals to places such as Long Beach, Jones Beach, the Hamptons, Montauk, and Greenport. Passengers traveling to the Hamptons and Montauk on the Cannonball can reserve a seat in the all-reserved Parlor Cars. Passengers going to Belmont Park must buy a special ticket to go from Jamaica to Belmont Park (or vice versa). Weekly and monthly passes are not accepted at Belmont Park. In 2003, the LIRR and Metro-North started a pilot program in which passengers traveling within the city limits were allowed to buy one-way tickets for $2.50. The special reduced-fare CityTicket, proposed by the New York City Transit Riders Council, was formally introduced in 2004. On weekends, the railroad offers the CityTicket for passengers who travel within Zones 1 and 3 (i.e. within New York City). CityTickets can only be bought from ticket agents or machines and used on the day of purchase. They are not valid for travel to Far Rockaway because it is in Zone 4 and the Far Rockaway Branch passes through Nassau County. It is also not valid for travel to the Belmont Park station, which is only open for special events. In fall 2017, the MTA was slated to launch a pilot that will allow LIRR, bus and subway service to use one ticket. The proposal for the ticket, called the "Freedom Ticket," was initially put forth by the New York City Transit Riders Council (NYCTRC) in 2007.:1 The NYCTRC wrote a proof of concept report in 2015. At the time of the report, express bus riders from Southeast Queens had some of the longest commutes in the city, with their commutes being 96 minutes long, yet they paid a premium fare of $6.50. Riders who take the dollar van to the subway paid $4.75 to get to Manhattan in 65 minutes; riders who only took the bus and subway paid $2.75 to get to Manhattan in 86 minutes; and riders who took the LIRR paid $10 to get to Manhattan in 35 minutes. :iii Unlike the CityTicket, the Freedom Ticket would be valid for off-peak and multidirectional travel; have free transfers to the subway and bus system; and be capped at $215 per month. :1–2 At the time, monthly CityTickets cost $330 per month. The Freedom Ticket will initially be available for sale at the Atlantic Terminal, Nostrand Avenue, and East New York stations in Brooklyn and at the Laurelton, Locust Manor, Rosedale, and St. Albans stations in Queens. Riders, under the pilot, would be able to purchase one-way, weekly, or monthly passes that will be valid on the LIRR, on buses, and the subway. The fare will be higher than the price of a ride on the MetroCard, but it will be lower than the combined price of an LIRR ticket and a MetroCard, and it will allow unlimited free transfers between the LIRR, buses, and subway. The former head of the MTA, Thomas Prendergast, announced at the January 2017 board meeting that the plan would be explored in a field study to determine fares and the impact on existing service. The plan is intended to fill approximately 20,000 unused seats of existing trains to Atlantic Terminal and Penn Station (or about 50% to 60% of peak trains in each direction), while at the same time providing affordable service to people with long commutes. The details were to be announced in spring 2017, and the pilot would last six months. The MTA Board voted to approve a six-month pilot for a similar concept, the Atlantic Ticket, in May 2018. The Atlantic Ticket is similar in that it would allow LIRR riders in southeast Queens to purchase a one-way ticket to or from Atlantic Terminal for $5. The Atlantic Ticket would start in June 2018. In 2017, it was announced that the MetroCard fare payment system, used on New York City-area rapid transit and bus systems, would be phased out and replaced by OMNY, a contactless fare payment system. Fare payment would be made using Apple Pay, Google Wallet, debit/credit cards with near-field communication enabled, or radio-frequency identification cards. As part of the implementation of OMNY, the MTA also plans to use the system in the Long Island Rail Road and Metro-North Railroad. West of Harold Interlocking in Sunnyside, Queens, LIRR trains enter the Amtrak-operated Northeast Corridor leading to the East River Tunnels. When this track was owned by the Pennsylvania Railroad, trains of the PRR connected to the LIRR at Penn Station. During the 1920s and 1930s a through sleeper was carried by PRR and LIRR trains from Pittsburgh to Montauk, called the 'Sunrise Special'. In Glendale, Queens, the LIRR connects with CSX’s Fremont Secondary, which leads to the Hell Gate Bridge and New England; however, once trains leave the secondary, they enter LIRR trackage. All LIRR trains have an engineer who operates the train, and a conductor who is responsible for the safe movement of the train, fare collection and on-board customer service. In addition, trains may have one or more assistant conductors to assist with fare collection and other duties. 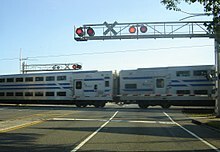 The LIRR is one of the last railroads in the United States to use mechanical interlocking control towers to regulate rail traffic. As of 2016[update], the LIRR has 8 active control towers. All movements on the LIRR are under the control of the Movement Bureau in Jamaica, which gives orders to the towers that control a specific portion of the railroad. Movements in Amtrak territory are controlled by Penn Station Control Center or PSCC, run jointly by the LIRR and Amtrak. The PSCC controls as far east as Harold Interlocking, in Sunnyside, Queens. The PSCC replaced several towers. The Jamaica Control Center, operational since the third quarter of 2010, controls the area around Jamaica terminal by direct control of interlockings. This replaced several towers in Jamaica including Jay and Hall towers at the west and east ends of Jamaica station respectively. At additional locations, line side towers control the various switches and signals in accordance with the timetable and under the direction of the Movement Bureau in Jamaica. Today's LIRR signal system has evolved from its legacy Pennsylvania Railroad-based system. The railroad utilizes a variety of wayside railroad signals including position light, color light and dwarf signals. In addition, much of the LIRR is equipped with a bi-directional Pulse code cab signaling called automatic speed control (ASC), though portions of the railway still retain single direction wayside only signalling. Unlike other railroads which began using color light signals in the 20th century, the LIRR did not begin using signals with color lights on its above ground sections until 2006. Some portions of the railway lack automatic signals and cab signals completely, instead train and track car movements are governed only by timetable and verbal/written train orders. On portions of the railroad equipped with ASC, Engineers consult the speed display unit, which is capable of displaying 7 speed indications. They are 80,70,60,40,30,15 on electric trains while some diesel locomotives have slightly lower speed-steps when compared to the electrics. As a result of a December 1, 2013, train derailment in the Bronx on the Metro-North Railroad, railroads with similar cab signal systems to Metro-North, such as the LIRR, were ordered to modify the systems to enforce certain speed limit changes, which has resulted in lower average speeds and actual speed limits across the LIRR. The LIRR's electrified lines are powered by 750 V DC third rail with the contact shoe running along the top of the rail, similar to on the New York City Subway and PATH systems. This system is incompatible with Metro-North's third rail, which is under-running, though the M8 and M9 fleets can use both types of third rails. The LIRR's electric fleet consists of 836 M7 and 170 M3 electric multiple unit cars in married pairs, meaning each car needs the other one to operate, with each car containing its own engineer's cab. The trainsets typically range up to 12 cars long. New M9 railcars leaving Brentwood Station during testing. In September 2013, MTA announced that the LIRR would procure new M9 railcars from Kawasaki. A 2014 MTA forecast indicated that the LIRR would need 416 M9 railcars; 180 to replace the outdated M3 railcars and an additional 236 railcars for the additional passengers expected once the East Side Access project is complete. As of early December 2018, it is estimated that 38 of the cars have been built and are currently being tested. The LIRR also uses 134 C3 Bilevel coaches powered by 24 DE30AC diesel-electric locomotives and 21 DM30AC dual-mode locomotives. They are used mostly on non-electrified territories, including the Port Jefferson, Oyster Bay, Montauk, and Greenport Branches. For most of its history LIRR has served commuters, but it had many named trains, some with all-first class seating, parlor cars, and full bar service. Few of them lasted past World War II, but some names were revived during the 1950s and 1960s as the railroad expanded its east end parlor car service with luxury coaches and Pullman cars from railroads that were discontinuing their passenger trains. The Cannonball, a Friday-only 12-car train to Montauk running May through October, with two all-reserved parlor cars with full bar service. Since May 24, 2013 it has originated at Penn Station with a Sunday evening return from Montauk; only the westward train stops at Jamaica. The two rear cars ("Hamptons Reserve Service") have reserved seating and exclusive bar service. The name is a nod to the Cannon Ball, the all-year train to Amagansett/Montauk from the 1890s until the 1970s. It carried parlor cars and standard-fare coaches and ran weekday afternoons from Long Island City, then from Penn Station until 1951, when DD1 operation, and changing engines at Jamaica, ceased. Fisherman's Special (1932–1950s) from Long Island City to Canoe Place Station and Montauk via Jamaica, April through October, terminating at Canoe Place in April, extended to Montauk in May. Served Long Island fishing trade. Peconic Bay Express / Shinnecock Bay Express (1926–1950) from Long Island City to Greenport and Montauk, Saturday only, express to Greenport and Montauk. Discontinued during World War II though revived for a few seasons afterwards. Shelter Island Express (1901–1903, 1923–1942) from Long Island City to Greenport, Friday-only summer express that connected to Shelter Island ferries. 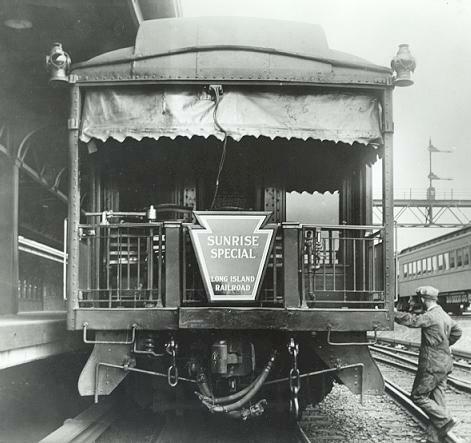 Sunrise Special (1922–1942) ran during the summer, NY Penn to Montauk on Fridays and westbound Mondays. In summer 1926 it ran daily. All parlor car (no coaches) from 1932 to 1937. For more details on the franchisee that runs freight service for the LIRR, see New York and Atlantic Railway. The LIRR and other railroads that became part of the system have always had freight service, though this has diminished. The process of shedding freight service accelerated with the acquisition of the railroad by New York State. In the 21st century, there has been some appreciation of the need for better railroad freight service in New York City and on Long Island. Both areas are primarily served by trucking for freight haulage, an irony in a region with the most extensive rail transit service in the Americas as well as the worst traffic conditions. Proposals for a Cross-Harbor Rail Tunnel for freight have languished more than a century. In May 1997, freight service was franchised on a 20-year term to the New York and Atlantic Railway (NYAR), a short line railroad owned by the Anacostia and Pacific Company. It has its own equipment and crews, but uses the rail facilities of the LIRR. To the east, freight service operates to the end of the West Hempstead Branch, to Huntington on the Port Jefferson Branch, to Bridgehampton on the Montauk Branch, and to Riverhead on the Main Line. On the western end it provides service on the surviving freight-only tracks of the LIRR: the Bay Ridge and Bushwick branches; the "Lower Montauk" between Jamaica and Long Island City; and to an interchange connection at Fresh Pond Junction in Queens with the CSX, Canadian Pacific, and Providence and Worcester railroads. The Garden City-Mitchel Field Secondary is a short remnant of the Central Branch that splits from the Hempstead Branch at Garden City, running to Uniondale near Hofstra University and Nassau Veterans Memorial Coliseum. This branch does not host any NYAR service. This branch is used by the Ringling Bros. Circus to transport animals, staff and equipment to the Nassau Coliseum. The Bushwick Branch runs west from the Montauk Branch at Maspeth to Bushwick Terminal. This was a passenger branch until 1924. The Bay Ridge Branch runs south and west from the Montauk Branch at Fresh Pond to Bay Ridge. At Fresh Pond, it meets CSX's Fremont Secondary, which goes over the Hell Gate Bridge towards Upstate New York and New England. At its southern end it interchanges with the New York New Jersey Rail, LLC cross harbor rail barge service to New Jersey. This branch had a passenger service until 1924 and a restoration of passenger service has been proposed. The East Side Access project is building a LIRR spur to Grand Central Terminal that will run in part via the existing 63rd Street Tunnel. The project will add a new eight-track terminal underneath the existing Grand Central Terminal. The project was first proposed in the 1968 Program for Action, but due to various funding shortfalls, construction did not start until 2007. As of April 2018[update], the project was expected to cost $11.1 billion and was tentatively scheduled to start service in December 2022. In 2012, the LIRR started adding a second track along the formerly single-tracked section of the Main Line between Farmingdale and Ronkonkoma stations to increase track capacity. The project was completed in September 2018. As part of the preparations for East Side Access's opening, the LIRR is also widening the two-track sections of the Main Line between Floral Park and Hicksville stations to three tracks. Work on the third-track project started in September 2018. The project's completion was estimated for 2022, in time for the opening of East Side Access. Five "readiness projects" are also under construction to increase peak-hour capacity across the LIRR system in preparation for expanded peak-hour service after the completion of East Side Access. The LIRR is constructing a new platform for Atlantic Terminal-bound trains at Jamaica station, in preparation for the conversion of the Atlantic Branch between these two stations into a high-frequency shuttle. The LIRR is also installing storage tracks at the Massapequa and Great Neck stations, as well as expanding train yards at Port Washington and Ronkonkoma stations. The LIRR Police Department, founded in 1868, was absorbed along with the Metro-North Railroad Police to form the Metropolitan Transportation Authority Police Department (MTA Police) in 1998. The LIRR has a long history of tense relations with its passengers, especially daily commuters. Various commuter advocacy groups have been formed to try to represent those interests, in addition to the state mandated LIRR Commuters Council. The LIRR has been criticized for not providing additional service to the East End of Long Island as the twin forks continue to grow in popularity as a year-round tourist and residential destination. Demand is evidenced by flourishing for-profit bus services such as the Hampton Jitney and the Hampton Luxury Liner and the early formative stages of a new East End Transportation Authority. Local politicians have joined the public outcry for the LIRR to either improve the frequency of east end services, or turn the operation over to a local transportation authority. Critics claim that the on-time performance (OTP) calculated by the LIRR is manipulated to be artificially high. Because the LIRR does not release any raw timing data nor does it have independent (non-MTA) audits it is impossible to verify this claim, or the accuracy of the current On Time Performance measurement. The percentage measure is used by many other US passenger railroads but the criticism over accuracy is specific to the LIRR. As defined by the LIRR, a train is "on time" if it arrives at a station within 5 minutes and 59 seconds of the scheduled time. The criterion was 4 minutes and 59 seconds until the LIRR changed it because of a bug in their computer systems. Critics believe the OTP measure does not reflect what commuters experience on a daily basis. The LIRR publishes the current OTP in a monthly booklet called TrainTalk. TrainTalk was previously known as "Keeping Track." A more accurate way to measure delays and OTP has been proposed. Called the "Passenger Hours Delayed" index it can measure total person-hours of a specific delay. This would be useful in comparing performance of specific days or incidents, day-to-day (or week-to-week) periods, but has not been adopted. Ridership has increased from 81 million passengers in 2011 to 89.3 million passengers in 2016, which is the railroad's highest ridership since 1949. The all-time highest ridership was in 1929, when 119 million passengers rode 1.89 billion passenger miles. This increase in ridership has been attributed to the increased usage of the LIRR by millennials, and the increase of reverse-peak travel. A New York Times investigation in 2008 showed that 25% of LIRR employees who had retired since 2000 filed for disability payments from the federal Railroad Retirement Board and 97% of them were approved to receive disability pension. The total collected was more than $250,000,000 over eight years. As a result, Railroad Retirement agents from Chicago inspected the Long Island office of the Railroad Retirement Board on September 23, 2008. New York Governor David Paterson issued a statement calling for Congress to conduct a full review of the board's mission and daily activities. Officials at the board's headquarters responded to the investigation stating that all occupational disability annuities were issued in accordance with applicable laws. On November 17, 2008, a former LIRR pension manager was arrested and charged with official misconduct for performing outside work without permission. However, these charges were all dismissed for "no merit" by Supreme Court Judge Kase on December 11, 2009 on the grounds that the prosecution had misled the grand jury in the indictment. A report produced in September 2009 by the Government Accountability Office stated that the rate at which retirees were rewarded disability claims was above the norm for the industry in general and indicated "troubling" practices that may indicate fraud, such as the use of a very small group of physicians in making diagnoses. Another series of arrests on October 27, 2011 included two doctors and a former union official. According to court documents, from 1998 through 2011, 79% of LIRR retirees obtained federal disability when they retired. On August 6, 2013, a doctor and two consultants were found guilty in connection with the accusations and sentenced to prison. ^ @LIRR (October 13, 2015). "The max allowable service speed for LIRR trains is 80 mph. But how fast are they DESIGNED to go? #TriviaTuesday" (Tweet). Retrieved July 2, 2018 – via Twitter. ^ "Transit Ridership Report Fourth Quarter and End-of-Year 2016" (pdf). American Public Transportation Association (APTA). March 16, 2017. Retrieved March 20, 2017. ^ "MTA - Transportation Network". mta.info. ^ a b c d "LIRR History". mta.info. Metropolitan Transportation Authority (MTA). Retrieved March 1, 2013. ^ a b c d e "Long Island Rail Road - General Information". Metropolitan Transportation Authority (MTA). Retrieved March 23, 2014. ^ "Comprehensive Annual Financial Report for the Years Ended December 31, 2012 and 2011" (PDF). Metropolitan Transportation Authority (MTA). June 21, 2013. p. 146. Retrieved August 29, 2014. ^ "MTA LIRR - A Reflection (1984)". mta.info. ^ American Railway Association, (Division V - Mechanical) (1922). Wright, Roy V.; Winter, Charles (eds.). Locomotive Cyclopedia of American Practice (6th ed.). New York, NY: Simmons-Boardman Publishing. p. 903. OCLC 6201422. ^ "STATE IN ACCORD WITH THE PENNSY ON BUYING L.I.R.R. ; P.R.R. Agrees on Price of $65 Million With New Transportation Agency" (PDF). The New York Times. June 3, 1965. ISSN 0362-4331. Retrieved January 31, 2018. ^ "ASSEMBLY VOTES COMMUTER BOARD; Bill Creates Transportation Authority for City Area" (PDF). The New York Times. May 21, 1965. ISSN 0362-4331. Retrieved January 31, 2018. ^ Penner, Larry (July 15, 2014). "Happy 51st Birthday To Queens Public Transportation". Queens Gazette. Archived from the original on September 12, 2015. Retrieved November 1, 2015. ^ "M.T.A. TAKES OVER TRANSIT NETWORK; Moses Will Be Kept On as Consultant to Agency" (PDF). The New York Times. March 2, 1968. ISSN 0362-4331. Retrieved February 1, 2018. ^ a b "$121 Million Initiative to Rebuild Hicksville Station Begins Construction; $64.9 Million Contract Award to Improve Jamaica Station". www.mta.info. Metropolitan Transportation Authority. September 21, 2016. Retrieved February 5, 2018. ^ "Airtrain JFK". mta.info. Archived from the original on February 26, 2013. Retrieved March 1, 2013. ^ "MTA | news | MTA's Proposed 2015 Budget Includes Systemwide Service Enhancements". Mta.info (Press release). Metropolitan Transportation Authority. July 29, 2014. Retrieved August 11, 2014. ^ "LIRR: Powering up a link will improve response". Newsday. September 26, 2018. Retrieved September 27, 2018. ^ Fazio, Alfred E (2008). The BMT A Technical and Operational History. pp. 28–31. ISBN 978-1-60702-864-2. ^ "CAMP UPTON - UPTON JUNCTION, LIRR". trainsarefun.com. ^ "LIRR Northport Spur". lirrhistory.com. ^ "8.02 - Query by Location". dot.gov. ^ "WADING RIVER BRANCH". arrts-arrchives.com. ^ "Penn Station". MTA LIRR. Retrieved January 19, 2019. "Queens Bus Map" (PDF). Metropolitan Transportation Authority. December 2017. Retrieved April 24, 2018. ^ "Maps and Schedules". Nassau Inter-County Express. Retrieved January 19, 2019. ^ "Suffolk County Transit System Map" (PDF). Suffolk County Transit. Retrieved January 19, 2019. ^ "MTA LIRR - Fares & Ticket Information". mta.info. ^ a b c "MTA LIRR - Fares & Ticket Information". mta.info. ^ "MTA LIRR - New Fares - Effective March 19, 2017". web.mta.info. Retrieved March 10, 2019. ^ a b "MTA LIRR - Fares & Ticket Information". mta.info. ^ "MTA LIRR - Hamptons Reserve Service: The Best Route to the Hamptons!". MTA. November 6, 2015. Retrieved December 25, 2015. ^ a b c d "MTA - CityTicket". mta.info. ^ a b Lisi, Clemente (July 15, 2003). "A RAILY CHEAP RIDE – $2.50 WEEKEND TIX ON LIRR, METRO-NORTH". New York Post. Retrieved February 9, 2017. ^ "CityTicket Begins Tomorrow on LIRR And Metro-North" (Press release). Metropolitan Transportation Authority. January 9, 2004. Retrieved February 14, 2010. ^ a b c d Barone, Vincent (February 8, 2017). "Freedom Ticket pilot launching in Brooklyn, Queens this fall, Borough President Adams says". am New York. Retrieved February 8, 2017. ^ a b c Brashears, Bradley; Shannon, Ellyn; Bellisio, Angela (December 2015). "Freedom Ticket Southeast Queens Proof of Concept" (PDF). New York City Transit Riders Council. Retrieved February 8, 2017. ^ a b Harshbarger, Rebecca; Teirstein, Zoya (December 2, 2015). "Freedom Ticket' could slash many hours from subway and bus riders' commutes, fight overcrowding, advocates say". am New York. Retrieved February 8, 2017. ^ a b Walker, Ameena (February 9, 2017). "MTA will launch reduced fare pilot program for outer-borough commuters". Curbed NY. Retrieved February 9, 2017. ^ a b c "MTA Will Test 'Freedom Ticket' For Commuters In Brooklyn And Queens Transit Deserts". Gothamist. February 8, 2017. Archived from the original on February 10, 2017. Retrieved February 9, 2017. ^ Barone, Vin (May 23, 2018). "LIRR pilot to slash ticket prices in transit deserts". am New York. Retrieved May 24, 2018. ^ Barron, James (October 23, 2017). "New York to Replace MetroCard With Modern Way to Pay Transit Fares". The New York Times. ISSN 0362-4331. Retrieved October 24, 2017. ^ "Say hello to tap and go, with OMNY". MTA. Retrieved February 24, 2019. ^ a b "The Sunrise Special". arrts-arrchives.com. ^ "Lirr map archives". trainsarefun. Retrieved July 6, 2015. ^ "LIRR launches new switching system". Newsday. Retrieved May 9, 2017. ^ Sciarrino, Robert (December 26, 2013). "How to squeeze 1,200 trains a day into America's busiest transit hub". NJ.com. Star-Ledger. Retrieved May 25, 2016. ^ Bedia, Leigh. "LIRR Jamaica Station Control Center." Railpace January 2011 : P. 10. ^ "Operational and signal modifications for compliance with maximum authorized passenger train speeds and other speed restrictions". fra.dot.gov. U.S. Federal Railroad Administration. Retrieved May 25, 2016. ^ "MTA LIRR - TrainTalk - March 2012". mta.info. ^ "MTA - news - New Railcars for LIRR & Metro-North Fleets". mta.info. Archived from the original on February 26, 2014. ^ "Capital Program Oversight Committee Meeting: July 2014" (PDF). MTA. July 28, 2014. ^ "First LIRR M-9 Cars Arrive from TTCI Testing". ^ "MTA Long Island Railroad Committee Meeting March 2018" (PDF). mta.info. ^ "LIRR to Operate First Non-Stop Service from Manhattan to Hamptons". MTA Long Island Rail Road. Archived from the original on April 23, 2013. Retrieved April 22, 2013. ^ a b "THE LIRR EXTRA LIST". trainsarefun.com. ^ "LIRR Fisherman's Special (Arrt's Arrchives)". Arrts-arrchives.com. Retrieved January 19, 2013. ^ Steinberg, Carol (January 31, 1999). "Bygone Era's Revival: Hauling Goods by Rail". New York Times. Retrieved September 15, 2009. ^ "Cross Harbor Freight Program: CHFP Tier 1 EIS Document". panynj.gov. ^ "At first this video might make you want to leave New York. But the end will make you want to stay forever". MoveNY. April 25, 2015. Retrieved July 5, 2016. ^ Neuman, William (May 11, 2007). "Awaiting Rock-Eating Beast, L.I.R.R. Tunnel Is Poised to Finish Trip to Grand Central". The New York Times. Retrieved February 3, 2018. ^ Siff, Andrew (April 16, 2018). "MTA Megaproject to Cost Almost $1B More Than Prior Estimate". NBC New York. Retrieved April 16, 2018. ^ Castillo, Alfonso A. (April 15, 2018). "East Side Access price tag now stands at $11.2B". Newsday. Retrieved April 16, 2018. ^ "Double Track' Information Center Opens Today at Ronkonkoma Station as Part of LIRR Public Outreach". mta.info. January 16, 2013. Retrieved April 10, 2015. ^ "news - LIRR Opens Ronkonkoma Branch Double Track". MTA. September 21, 2018. Retrieved September 22, 2018. ^ "LIRR Double Track project completed ahead of schedule". ABC7 New York. September 21, 2018. Retrieved September 22, 2018. ^ "Main Line Corridor Improvements Project Presentation" (PDF). Metropolitan Transportation Authority. Retrieved January 7, 2016. ^ Fitzsimmons, Emma G. (January 5, 2016). "Cuomo Revives Long-Stalled Plan to Add Track to L.I.R.R." The New York Times. p. A18. Retrieved January 7, 2016. ^ "LIRR Main Line Expansion Will Ease Commuting and Attract Businesses and Jobs" (Press release). Metropolitan Transportation Authority. January 5, 2016. Retrieved January 19, 2016. ^ "LIRR Third Track Project Moving Forward Despite Concerns Of Residents". CBS New York. September 5, 2018. Retrieved September 6, 2018. ^ Rivoli, Dan (September 5, 2018). "Cuomo continues infrastructure tour with Long Island Rail Road groundbreaking". New York Daily News. Retrieved September 6, 2018. ^ Berger, Paul (December 13, 2017). "MTA Awards $1.8 Billion Contract to Expand Long Island Rail Road". The Wall Street Journal. Retrieved January 25, 2018. ^ Castillo, Alfonso A. (December 13, 2017). "MTA approves $1.9B contract to design, build LIRR 3rd track". Newsday. Retrieved January 25, 2018. ^ Klar, Rebecca (December 20, 2017). "MTA approves $1.8B contract for third track project". The Island Now. Retrieved January 25, 2018. ^ Anuta, Joe; Newman, Philip (June 5, 2013). "Queens Tomorrow: LIRR headed to Grand Central". TimesLedger. TimesLedger Newspapers. Retrieved May 24, 2018. ^ "MTA Capital Program Oversight Meeting" (PDF). mta.info. Metropolitan Transportation Authority. January 2013. p. 8. Retrieved May 24, 2018. ^ a b c "MTA Long Island Rail Road Committee Meeting" (PDF). mta.info. Metropolitan Transportation Authority. November 2017. p. 35. Retrieved May 24, 2018. ^ Kulick, Beth (2014). "Jamaica Interlocking Reconfiguration Operations Simulation" (PDF). apta.com. TranSystems Corporation. Retrieved February 5, 2018. ^ Wendy Karpel Kreitzman (November 19, 2010). "MTA Announces Second Pocket Track Proposed for LIRR in Great Neck". Great Neck Record. Archived from the original on December 9, 2010. Retrieved May 24, 2018. ^ "L60601YL Port Washington Yard Reconfiguration". web.mta.info. Metropolitan Transportation Authority. Retrieved September 3, 2017. ^ "Mid-Suffolk Yard Schedule". mta.info. Metropolitan Transportation Authority. Retrieved November 2, 2015. ^ "L.I.R.R. POLICE DEPT". arrts-arrchives.com. ^ Maloney, Jennifer; Schuster, Karla (January 19, 2007). "The Gap What We Found, Thirty Years of Neglect". Newsday. ^ Halbfinger, David M. (July 30, 1999). "The Long Island Rail Road: Busiest, but Far From Best". New York Times. Retrieved September 15, 2009. ^ "LIRRCC Mission Statement & Goals « The Permanent Citizens Advisory Committee (PCAC) to the MTA ( NY, NY)". PCAC. Archived from the original on August 13, 2014. Retrieved August 11, 2014. ^ "eastendshuttle.org". eastendshuttle.org. Retrieved January 19, 2013. ^ "– LIRR On Time Performance questions". Lirrcommuters.org. Retrieved January 19, 2013. ^ "– LIRR Commuters Campaign". Lirrcommuters.org. Retrieved January 19, 2013. ^ "MTA LIRR - TrainTalk - March 2015". Mta.info. Retrieved April 7, 2015. ^ Kluger, Barry L. (December 2007). "THE LONG ISLAND RAIL ROAD'S LOST PROPERTY PROCESS MTA/OIG Report #2007-22" (PDF). OIG. MTA Inspector General State of New York. Retrieved March 10, 2016. ^ "– New OTP Proposal". Lirrcommuters.org. Retrieved January 19, 2013. ^ "LIRR, AirTrain, Tri-Rail Note Higher Annual or Daily Passenger Counts". Progressive Railroading. February 8, 2008. Retrieved September 15, 2009. ^ "LIRR and Metro-North Railroad Break Ridership Records". mta.info. Metropolitan Transportation Authority. January 23, 2017. Retrieved January 25, 2017. ^ a b Bogdanich, Walt; Wilson, Duff (September 23, 2008). "Agents Raid Office in L.I.R.R. Disability Inquiry". New York Times. Retrieved September 15, 2009. ^ Castillo, Alfonso A. (December 11, 2009). "Judge dismisses most charges against LIRR official". Newsday. Retrieved March 4, 2011. ^ "Manhattan U.S. Attorney Announces Pension Disability Fraud Charges Against 11 Defendants Associated with the Long Island Railroad That Could Cost $1 Billion". FBI – New York Field Office. October 27, 2011. ^ "Doctor And Two Consultants Found Guilty In Manhattan Federal Court In LIRR Disability Fraud Scheme". DOJ – Southern District of New York. August 6, 2013. ^ "Disability Doctor Peter J. Lesniewski Sentenced in Manhattan Federal Court to Eight Years in Prison for His Role in Long Island Railroad Fraud Scheme". FBI – New York Field Office. February 21, 2014. ^ "Disability Doctor Peter J. Ajemian Pleads Guilty in Manhattan Federal Court for His Role in Long Island Railroad Fraud Scheme". FBI – New York Field Office. January 18, 2013.